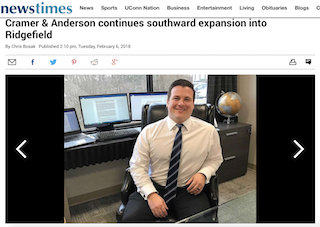 The News-Times of Danbury, a Hearst Connecticut Media newspaper, published a story in early February on Cramer & Anderson’s opening of a new office in Ridgefield and Partner Josh Weinshank’s role in helping to guide the firm’s expansion in Fairfield County. 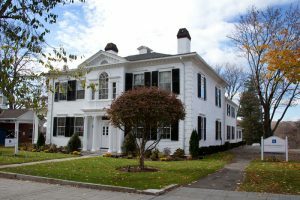 The Ridgefield office, located at 38C Grove Street, is the firm’s sixth location. With its hometown sensibility, increasingly strong regional presence, and worldly outlook, the firm provides sophisticated legal services to clients from across the state in nearly 20 Practice Areas. Attorney Weinshank’s practice focuses on Elder Law, Estate Planning, Probate and Trust Administration. Joining him in the Ridgefield office two days a week is Partner Ken Taylor, who primarily handles Divorce & Family Law cases, specializing in the collaborative divorce model, as well as Real Estate Law and general litigation, including Personal Injury Law and Workers’ Compensation. Attorney Weinshank, who lives in Ridgefield with his family, is a member of the Finance Committee of the Ridgefield Visiting Nurse Association (RVNA), and the Board of The Ridgefield Playhouse. Additionally, he is a member of the Associate Board of the Danbury Hospital and New Milford Hospital Foundation, and Co-Chair of the Ability Beyond Planned Giving Advisory Council. Attorney Weinshank may be reached by email at jweinshank@crameranderson.com and by phone at the Ridgefield office at (203) 403-4005.